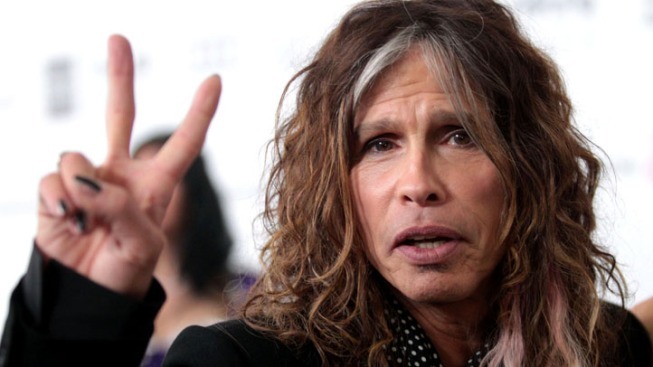 Steven Tyler Quits "American Idol"
He's leaving "Idol" to refocus on his own music. Steven Tyler's "Idol" days are done. The Aerosmith front-man and "American Idol" judge for the last two seasons announced Thursday that he will not be returning for season 12. "After some long... hard... thoughts... I've decided it's time for me to let go of my mistress 'American Idol' before she boils my rabbit," he wrote in a statement. "I strayed from my first love, AEROSMITH, and I'm back — but instead of begging on my hands and knees, I've got two fists in the air and I'm kicking the door open with my band." Fox President Mike Darnell said he was sad that Tyler was leaving but that "we always knew when we hired a rock 'n' roll legend, he would go back to the music." It is also unclear if Randy Jackson, the only one of the show's three judges who has been around since season one, will return for “Idol’s” next season. A source told Us Weekly Thursday that Jackson, who has been with the show since it began, plans to leave the judging panel, too, but plans to stick around as a mentor. The source told Us that the show's producers wanted to "freshen everything up" and were eyeing another pop superstar to add to the judges panel: Mariah Carey. "They are in serious talks with Mariah, and it's very close to being a done deal," the source said. The news of Tyler's departure and Randy's possible one came just hours after the third "Idol" judge, Jennifer Lopez, offered her strongest hint yet that she too may plan to leave. The actress, dancer and pop star said on the “Today” show Thursday that being a judge on “Idol" meant that she’s had to put other projects on hold. "Like I said, I’ve just enjoyed it so much," Lopez said. "But I am thinking that maybe it’s time for me to go and do other things that I really love to do." Lopez, who recently returned from South America as part of her first world tour with Enrique Iglesias, said that she’s been making up her mind on her future "little by little." "You know, I signed on to ‘American Idol' to do one year, and… I wound up doing the two years," Lopez said. "And now it’s like, ‘OK, do we continue on this journey?' I’ve loved it so much. I enjoy the show so much. I enjoy just the whole process of the show and the whole thing. And so it’s a tough decision either way. But I have to say that there are so many other things that I do, and that I put on hold for that. At the end of the day, whichever way, it’s a heartbreaking decision if I’m gonna have to go," she said.